Ontario consumers won't see a separate line item on their natural gas bills showing the cost of the Liberal government's cap-and-trade plan to fight climate change. Ontario's opposition accuses the government of trying to hide the cost of its climate change plan by not having a separate item for cap-and-trade on natural gas bills. The Ontario Energy Board announced charges related to the cost of cap-and-trade, which is aimed at reducing greenhouse gas emissions, will be included in the "delivery" line charge on natural gas bills. The vast majority of Ontario homes are heated with natural gas. The energy board admitted that utilities and industrial natural gas users had argued for a separate line item to provide transparency to customers about the cost of cap-and-trade. Progressive Conservative energy critic John Yakabuski said people have a right to know how much cap-and-trade will cost them every month, and accused the Liberals of trying to "bury the evidence" that the plan is just another cash grab. "It's apparent that the OEB has become more focused on protecting the Kathleen Wynne government than it is the consumer," Yakabuski said in an interview. "They're going to hide this charge, which is typical of what we've come to expect from the Liberals, but it is absolutely wrong." The New Democrats said the Liberals clearly have "a problem with transparency," despite campaigning on a promise to be transparent and accountable. "We believe the system needs to be fair, effective and transparent," said NDP environment critic Peter Tabuns. "This decision isn't transparent, and people deserve better." The Liberals have said that their climate change plan would add about $5 a month to home heating bills and 4.3 cents a litre to the price of gasoline. Energy Minister Glen Thibeault's office issued a statement Friday saying the energy board had an important role to play as "a non-political, quasi-judicial regulatory body," and the government respected the decision not to have a separate line on natural gas bills showing the cost of cap-and-trade. "We have been open, transparent and up front with Ontarians about our climate change action plan, including its costs and benefits," the statement said. "Climate change is already costing us with increased insurance rates, higher food costs, and weather-related damage." The opposition parties said to make matters worse, consumers will pay the HST on the cap-and-trade costs, which Yakabuski said amounts to "a tax on top of a tax." "Adding HST on top of carbon pricing doesn't make the system more fair or effective," said Tabuns. "It will only lead to opposition." 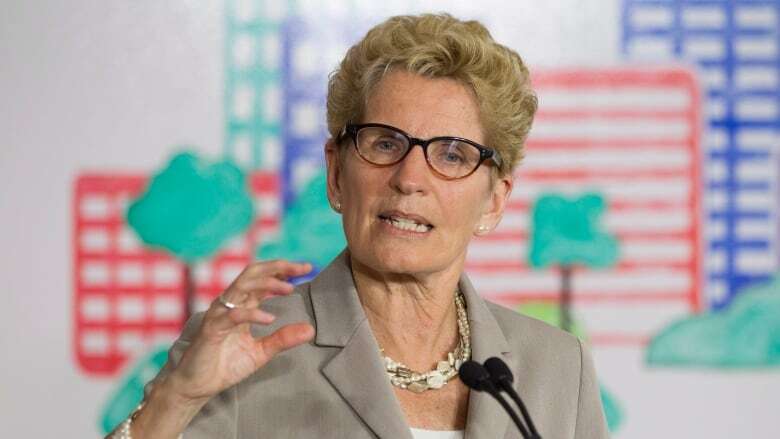 Ontario will join an existing cap and trade market with California and Quebec next January, mandating emission limits on polluters but allowing them to buy emission credits or sell them to other companies if they are under their quota. The province plans to spend up to $8.3 billion on programs to encourage people and companies to switch to more energy-efficient heating systems, buy electric or hybrid cars, convert big trucks to natural gas, add more bio-fuel to gasoline, and help the agriculture and industrial sectors adopt low-carbon technologies. Most of the money for those plans will come from cap-and-trade, which the Liberals predict will raise $1.9 billion a year, and all of which they pledge will go into a dedicated fund for lowering Ontario's carbon footprint.